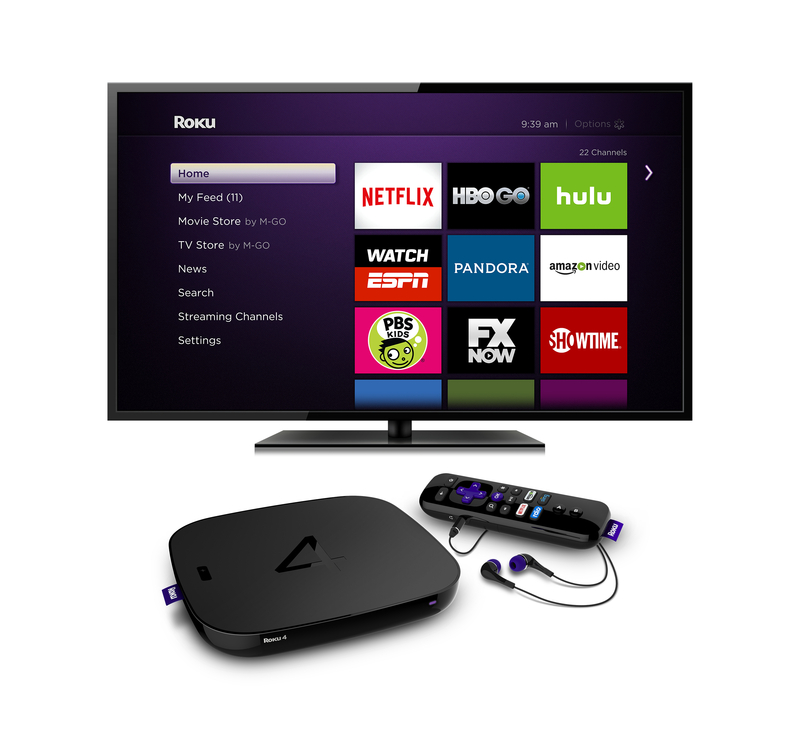 "The Roku 4 is our best streaming player ever"
SARATOGA, Calif.--(BUSINESS WIRE)--Roku Inc. today announced the highly anticipated Roku® 4 streaming player. Designed for entertainment-loving streamers, the Roku 4 features superior streaming performance and brilliant picture quality for both 4K Ultra HD (UHD) and HD TVs. With access to one of the biggest streaming channel lineups including 300,000 movies and TV episodes and the industry’s most comprehensive and only unbiased universal voice search, finding what to stream is simple with the new Roku 4. Plus, now consumers will no longer need to look for their remote control with the new Remote Finder feature. The Roku 4 runs the new Roku OS 7 that the company also announced today. Roku OS 7 is filled with new discovery features that give consumers more access to entertainment choices. With a major update to the Roku Feed consumers can now follow movies, TV shows, actors and directors to receive automatic entertainment updates about pricing and availability. Those at college or who travel and want to stream will now be able to use the new Hotel and Dorm Connect feature for quick wireless connectivity in locations that require log-in credentials to access the network. In addition, the redesigned Roku mobile app brings more control to the Roku experience from a mobile device, and soon will feature an on-the-go mode that allows for access to features such as the Roku Feed while away from home. In March, Roku introduced the Roku Feed, a first-of-its-kind discovery feature that lets consumers know when favorite entertainment becomes available for streaming – and at what price. At that time the company debuted Movies Coming Soon, which allows consumers to “Follow” box office movies they’re interested in and receive automatic updates when the movie becomes available for streaming, from what provider and at what price. With Roku OS 7, consumers can now follow movies, TV shows, actors and directors to receive automatic updates in their Roku Feed from select partners. Consumers will receive updates when a movie or a new episode of a TV show becomes available, or the price changes. Notifications on the Roku Home Screen help consumers easily discover when they have new updates in the Roku Feed. Additionally, new updates within the Roku Feed are clearly marked so consumers can quickly identify new information about the entertainment they follow. Roku is also releasing a major update to the free Roku Mobile App for iOS and Android making it easier for consumers to access key features including Roku Search, Roku Feed, Remote Control and Play on Roku. Now, with just the tap of the screen, consumers can instantly access Voice Search, view and add to Roku Feed, launch Play on Roku to display their photos and videos on the big screen and much more. Similar to the Roku Home Screen, the Roku Mobile App also displays notifications to make consumers aware of new updates in the Roku Feed. Additionally “Pinch to zoom” capabilities let consumers view every detail of their personal photos. Consumers with 4K photos on their mobile device can cast their photos and even create new screen savers that play when Roku 4 is idle. Hotel and Dorm Connect is a new feature that allows consumers to connect their Roku player, Roku TV and Roku Streaming Stick® to Wi-Fi networks that require sign-in through a web browser like those commonly found in hotel rooms, college dorms and other public locations. Consumers simply connect their Roku device to the password-protected network, sign-in with their login credentials using the browser on their mobile phone, tablet or laptop, and they’re ready to start streaming. Now consumers have TV on their terms anywhere they go, whether it’s after a long day of classes, on a family vacation or in the hotel on a business trip. 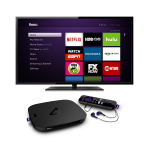 The Roku 4 is available for pre-order today from www.roku.com and major retailers for a MSRP of $129.99. It will be available in October. Roku OS 7 will be rolled out to current-generation Roku players and Roku TVs through a software update beginning in mid-October and is expected to be completed in November. At the heart of the Roku streaming platform is the Roku OS, a powerful operating system purpose-built for the TV screen. Designed to run on affordable streaming players and TVs, the Roku OS gives consumers a superior entertainment experience while enabling channel developers to effectively grow and monetize their audiences through advanced development, billing, and advertising tools. Using Roku Scene Graph, content providers can quickly develop custom streaming channels and deliver content to millions of devices worldwide. Roku Billing offers seamless, one-click subscription to certain Roku channels, streamlining users' access to content, while accelerating developers’ user acquisition efforts. Roku's Ad Framework enables advertisers to reach Roku’s large audience of TV streamers with sophisticated advertising tools, while helping developers bring more, free, ad-supported content to Roku users. Roku is the creator of a popular streaming platform for delivering entertainment to the TV. Roku streaming players and the Roku Streaming Stick® are made by Roku and sold through major retailers in the U.S., Canada, the U.K., the Republic of Ireland and Mexico. Roku licenses a reference design and operating system to TV manufacturers to create co-branded Roku TV models. Under the Roku Powered™ program, Roku licenses its streaming platform to Pay TV providers around the world who want to use the Internet to deliver entertainment services through streaming players. Roku was founded by Anthony Wood, inventor of the DVR. Roku is privately held and headquartered in Saratoga, Calif., U.S.
Roku and Streaming Stick are registered trademarks and Roku TV and Roku Powered are trademarks of Roku, Inc. in the U.S. and in other countries.